It is a mind-boggling question why do people kill themselves despite the explicit religious and cultural mores condemning the very act of suicide in most societies like the Pakistani society? What are the ends and goals which the suicidal person pursues and which are to him or her stronger than the gift of life itself? and why do some people give up life so easily; whereas most of us do not attempt nor think of attempting suicide even under severely stressful and distressing conditions? 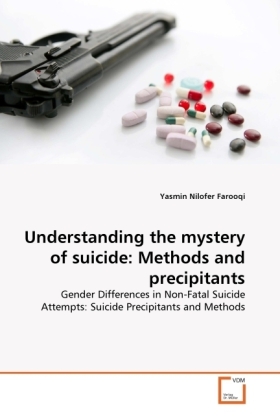 The main purpose of this book is to answer these pertinent questions in order to promote awareness and understanding of the helping professionals as well as the general public about the suicide methods and suicide precipitants for non-fatal suicide attempts in patriarchal society of Islamic Republic of Pakistan. It is hoped that this book which is based upon the indigenous research work of the author, will be of immense value for the researchers, practitioners, under-graduate and graduate students of clinical psychology, psychiatry, applied psychology, sociology and social work.